Pullbox Reviews: Chasing Hitler #1- What if history is wrong? As WWII draws to an end and the Allies surround Berlin, Adolf Hitler realizes that all is lost. Or is it? 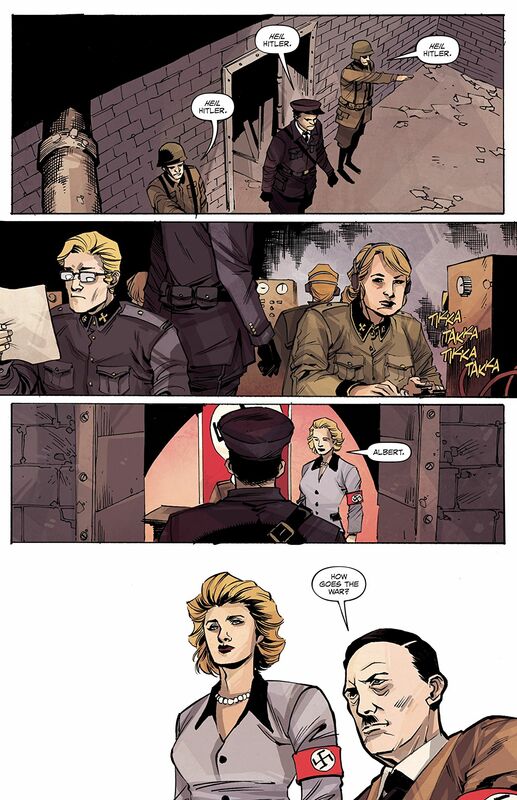 Two allied service men are tasked with verifying Hitler’s death. When they can’t the chase begins. As Allied forces closed in on Hitler’s base of power in Berlin, Albert Speer brings the Fuhrer the bad news. To further hammer home the impending defeat, Speer reports that Hitler’s orders for a “scorched earth” would not be carried out, that Germany would live on for future generations. To say that Hitler was disappointed would be an understatement. Rather than face capture by the hated Soviets, the Fuhrer announces that he and his bride-to-be Eva would commit suicide, that their bodies were to be shot and burned so as to leave no doubt that they faced defeat on their own terms. However, even the members of Hitler’s inner circle had no idea that his plans reached a bit farther than a simple double suicide. Allied Majors Alex Taylor and Conner Walsh are acting under different orders, having been personally tasked with the apprehension of Adolf Hitler by none other than Winston Churchill and General Eisenhower. With that single goal in mind, Taylor and Walsh race through the countryside, determined to get to the Fuhrer before he’s executed by an over-eager soldier. Aware of Hitler’s pride, the officers aren’t focused on finding him in his bunker, but are convinced that he’s already acting on escape plans in place. To that end, Majors Taylor and Walsh prepare to begin the Chase! This is a title that first caught my attention in a twitter post. 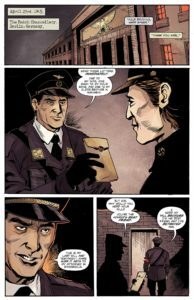 Creator Hayley Nitz and Red5 Comics had announced that in honor of Veteran’s Day, the first issue would be given away for free in pdf form to any veterans and active duty military who emailed in. First of all, at a time when patriotism and appreciation for our military members is less than trendy, any nod at all is something I take note of. Add to that the willingness of a publisher and creator to give away their product as a token of respect, and I’d pretty much made up my mind that I was going to be checking out the series. When I checked my email and saw that I’d already been given access to review pdfs for the entire series… well hell, that was just icing! Creator and co-writer Hayley Nitz came up with the idea for this story during a talk with her freshman history teacher two years ago, where she posed the question, “What if Hitler had lived?” You heard me right, Chasing Hitler was born in the imagination of a 16 year old from Olathe, Kansas, who had the gumption to question history, and then to come up with her own idea of how it might have played out if the books all had it wrong. 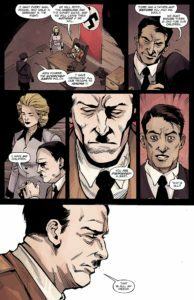 Now, after a successful Kickstarter campaign to fund and produce the first issue, Hayley has the chance to see her “what if?” presented in full color. Thankfully, when it came down to the nitty gritty of writing her story, she was in a pretty good spot… Her uncle is Jai Nitz , already a professional comicbook writer with a pretty jazzy resume’ (Dream Thief, Blue Beetle, El Diablo, and my personal fave so far… Fu Jitsu). This opening issue gives us a pretty solid setup to lead into what looks to be a pretty fast-paced series (four issues, so a lot to get done). Hopefully, we get a better pay off than the History Chanel’s series, Hunting Hitler… a whole lotta “evidence”, but no real proof or resolution. I like the look of this book, as well. With the art and colors by the team of Jethro Morales & Marie Enger, they’ve come up with a look that’s in keeping with the time period of World War II. No one is strutting around looking like Captain America or Sgt Rock. The main characters of Majors Taylor and Walsh are decked out in the appropriate uniforms, scrambling for supplies and aid at a time when both are running pretty scarce. There’s also a great feel for cinematography in the individual panels, with more dynamic angles and the promise of much action to come. Colors are more muted, also in keeping with the art and style of the time. All in all, Morales and Enger have put together a solid book with a great look. 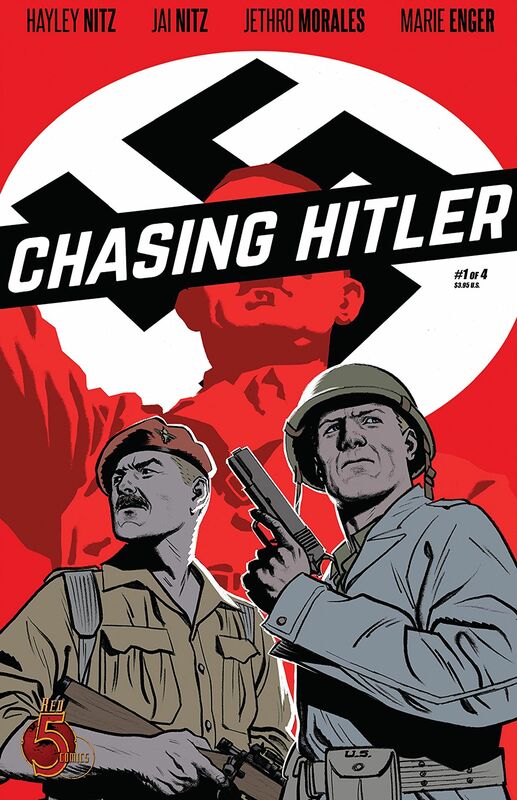 Impressive enough for its subject, Chasing Hitler is more so because of its origin in a high school history class, born from the imagination of a high school freshman. And how many high schoolers come up with an idea as ambitious as this, write it all down, and have the tenacity to make it happen the way Hayley Nitz did? If you want to support diversity in comics, encourage new voices who are putting out new ideas instead of rehashing the same old thing over and over again, this independent title is a pretty good way to start.